It's your favorite!!! It's ANYTHING GOES week over on the Simon Says Stamp Wednesday Challenge blog! This week the Design Team is using Avery Elle products. Naturally, I chose ice cream. Because... ICE CREAM!!!! I had so much fun with this The Scoop clear stamp set! I think I may have to add some Christmas lights for holiday cards this year!!! I stamped the background in a pale grey with the larger ice cream cone and then layered my little scene over the stamped background. I colored this one with colored pencils and I so enjoyed the process! 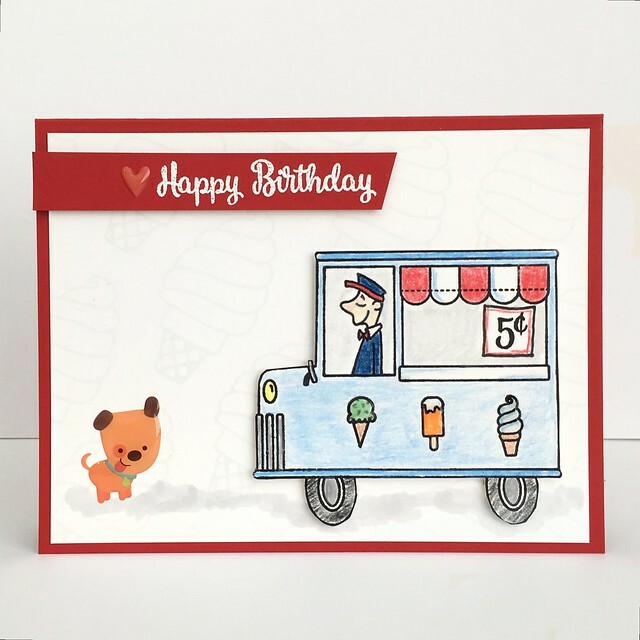 The little puppy is from the Doodlebug Puppy Love Sprinkles sticker set. I LOVE THEM SO MUCH!!!! Now it's YOUR turn! Create something awesome, ANYTHING awesome, and link it up! It has to be something NEW. One lucky participant will win a $50 Gift Certificate to the Simon Says Stamp Store! WOOT! WOOT! super cute , fun and yummy! Hehehe!! Such a fun scene, Jennifer! What a fun card ! This little dog is so cute ! Very clever idea the light gray ice cream in the background ! Thanks for sharing. Really cute and very yummy. Thank you for sharing.